Cleaning for an open house shouldn’t just be relegated to the inside of your home. The first impression people get is when they drive up and so curb appeal should be a priority. Be sure to clear away dead brush. Weed the flower beds, make sure your lawn is free of garbage, cut the grass, and park your cars elsewhere while the open house is happening. If your front door needs a new coat of paint, consider doing that, too. If you don’t have the time to give your home a really good cleaning before staging an open house, give a company that specializes in professional cleaning services a call. They will take that chore off your plate. You may want to have them clean the windows and deep clean any carpets as well. There is nothing more off-putting to prospective buyers than dirt and clutter. When they walk into your home, they imagine what it feels like to live there. Get rid of all the clutter that may make your home appear smaller. Put away knick-knacks and mementos to create a more minimalist look since this creates a more spacious and clean feel, and it’s a style that many people are embracing today. Although you may love the doll collection your grandmother left you, a possible buyer may not. You don’t want people focusing on all your personal items when they should be focusing on the home. Pack your personal things away– you’ll have to do so sooner or later anyways! You love your pets and consider them family members but some people who may be attending your open house might not. It may be best if you had someone look after them out of the home for a couple hours that day. If they have had accidents on carpeting, professional cleaning services may need to be called in. Bake a batch of chocolate chip cookies or an apple pie just before your open house. People love the smell of freshly baked treats and this could lead them to associate sweet and happy memories with your home. 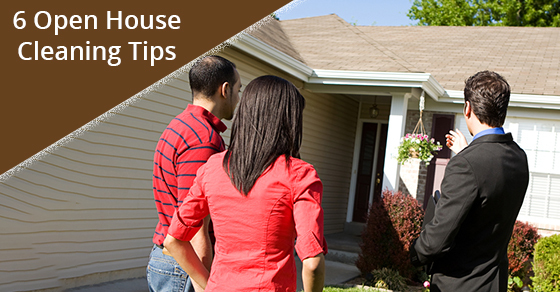 A positive impression of your home will get you closer to that sale. Contact Sunrise-Cleaning if you’re in need of a one-time cleaning for your open house!